But pecans. And not just any pecans, but roasted, salted pecans. 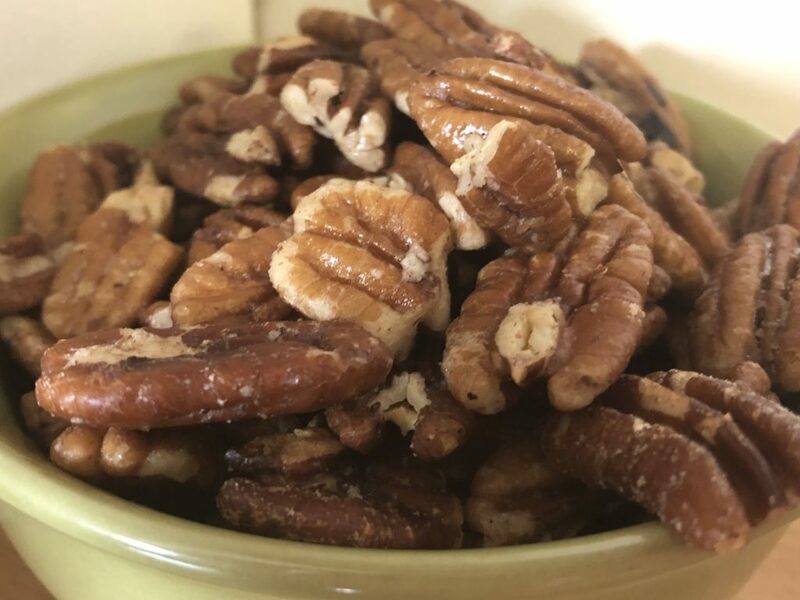 And do you know how much roasted, salted pecans can take out of a $25 grocery budget for the week (one that includes toiletries, groceries, and cleaning products)? Yeah…they can be upwards to $20 a pound! (Like these amazing, dry roasted with pink Himalayan salt ones.) Super yummy but I can’t spend the entire week’s grocery budget on a snack! 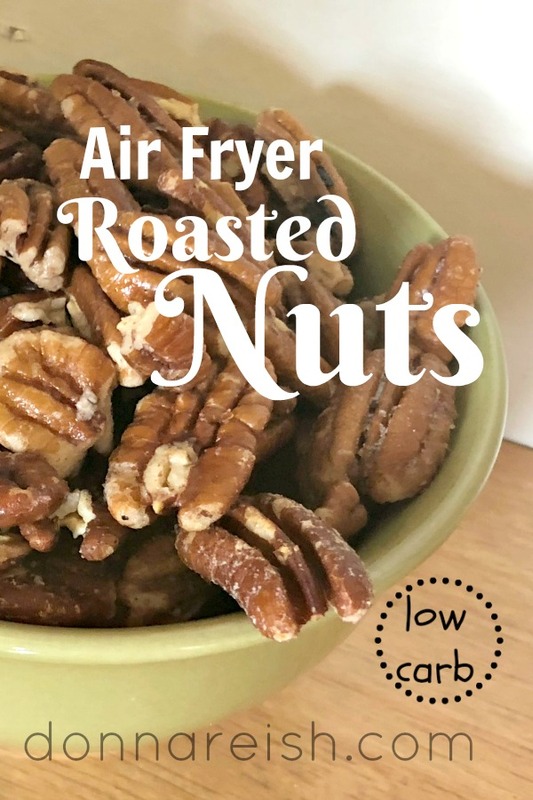 So with air fryer in hand and determination in my heart, I purchased these pecans at Costcos and learned how to make my own roasted pecans with pink Himalayan salt in my amazing air fryer! And it was super fast and simple! And they tasted even better than store bought as they were more tender (and were all halves, not pieces). I think you’ll love them! The proportions in the recipe are great for any nut–or a combination of nuts. 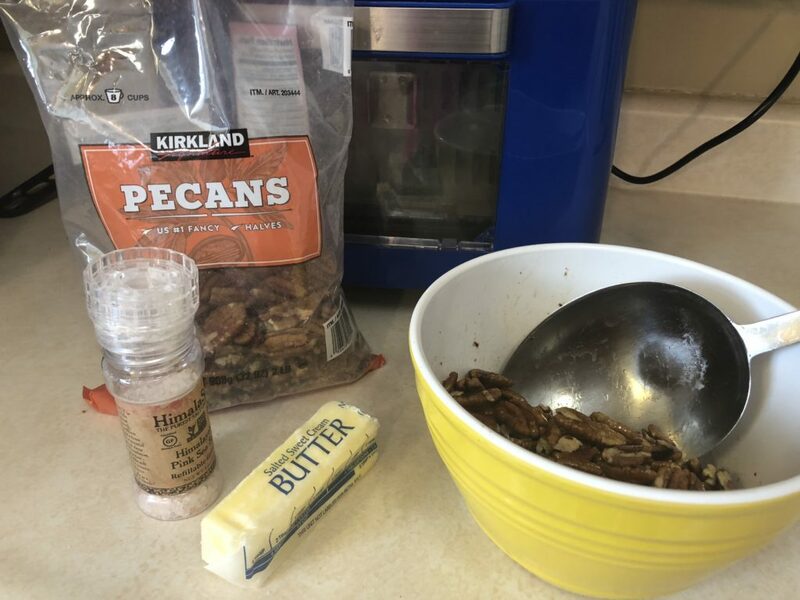 I want to try making my own mixed nut combination with my favorites—almond, cashews, and pecans! I’ll keep you posted on that. In the meantime, I am enjoying my newly-opened eating window right at this moment with these amazing nuts after fasting for twenty-one hours. What a way to break the fast!
) Preheat air fryer to 200 degrees for five minutes or so.
) Melt butter/ghee/oil and stir in salt.
) Toss pecan halves into the butter and stir until fully coated.
) Place in air fryer and fry for 4 to 6 minutes at 200 degrees until toasty and yummy, tossing every 2 minutes or so.